Fotoboard is designed to manage and share photos on your iOS device. Taking the advantages of the powerful iOS 4.0, now you can quickly download your iPad original photos to your Mac/PC via Wifi Share service without any cable or iTunes sync. You can create albums for your photos in library, and you can quickly share them to twitter and facebook within seconds. Want to find back your photos taken on your birthday or anniversary day? No, problems. With Fotoboard's calendar view, you can navigate and browse photos in a monthly calendar view. ★ Wifi Share with Permanent URL. Browse your iPhone/iPod photos on your Mac/PC browser. Permanent URL is designed for people who hate typing IP address and port number. You can use a custom domain name, such as: http://jack.foto.bo, to browse photos on your device. ★ Upload Photos to iPad from Desktop Browser. With Fotoboard, now you can easily upload photos to iPad photo library via Wifi Share service. New Wifi Share service also allows users to browser and copy photos from other device's photo library by typing in their device IP address or foto.bo service account name. iOS built-in Photo.app is lacking manual album organization. Fotoboard allows you to create different albums for your beautiful pictures. Fotoboard also shows map of the location where you took that picture. Quickly find those photos you took on a specific day. We think that this feature will be so handy for many users. Just a few taps. You can quickly tweet your favourite pictures and upload them altogether to facebook. This is a must-have photo app for your iPad, to organize, navigate and share photos to the web or between iOS devices. Fotoboard is also available for iPhone/iPod. You can download photos from another iPhone/iPod which also has Fotoboard installed. Please search Fotoboard on App Store to find it. 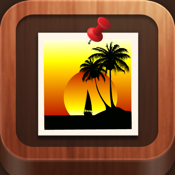 DOWNLOAD Fotoboard Free for your iPhone or iPod Touch now!! !